A gorgeous rosy glow inspired by snow bunnies? Totally not impossible to mimic ... at least when you have Maybelline Dream Mousse Blush in Peach Satin at the ready. I was actually very curious about this product for months before I finally bit the bullet and tried it out. How could such a fluffy consistency produce the perfect flush, I wondered. But you know what? It totally and completely works. First off, the blush is this amazingly fluffy, lightweight goodness that honestly looks like whipped air. It's so delightfully lush, but somehow totally light at the same time. Baked into the formula are these gorgeous shimmery particles that bring out every ounce of light in the room -- in a good way! -- so you don't look shiny at all; rather you sparkle and shimmer. Now here's how to apply it. Simply dip your index finger into the glass tub, take out a tiny amount and smudge it onto the apples of your cheeks. Rub it in and you'll be left with the most gorgeous rosiness imaginable! 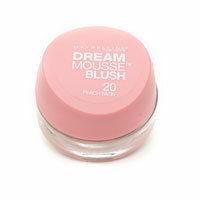 Unfortunately this product is no longer available, but you can find other Maybelline blushes at drugstore.com. I wrote an article about this too! It's so amazing! I have one I keep in my purse too! It's so great! !